I've noticed my Kaby Lake i7 laptop with 16GB RAM become extremely slow at time even when not performing any CPU intensive tasks. I've tried to find out the culprit process and it turned out to be Gnome Software. It was consuming 99% of CPU. I remember having clicking "update all" in Gnome Software some time ago and also "check for updates" in control center's details section some time after that. Seen that this morning on a fully updated artful. Shortly after boot, a gnome-software process started consuming 100% CPU and continued doing so for a few hours, after which I killed it. It's done it again this morning. See attached screenshot. Same experience than Olivier on resume from suspend. 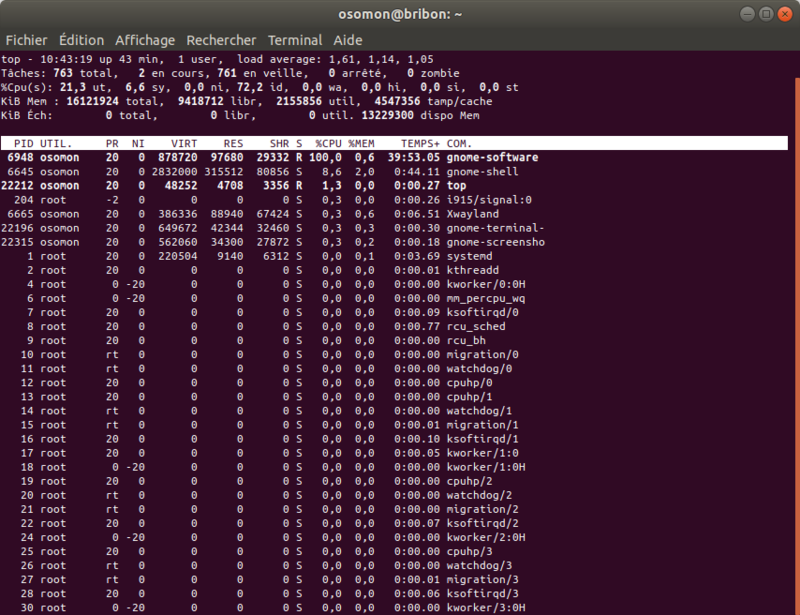 gnome-software was using 200% CPU. I heard the fan spin up less than a minute after I removed d-feet. Maybe something was queued to scan that desktop file and it was gone by the time it was ready to scan it? I briefly used strace on the process and it just looked like a bunch of waits, nothing that looked interesting. I left it in this state for over 2 hours to see if it would ever recover, but it didn't and I ultimately killed the gnome-software process.